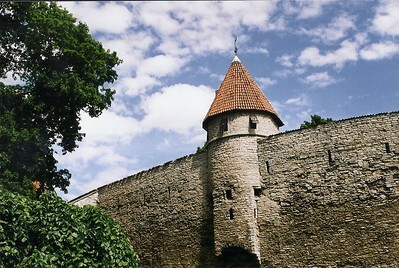 The Historic Centre (Old Town) of Tallinn was one of the best fortified cities in Europe, with 66 towers adorning the city wall. Only about 20 of them remain today. Its history as a trading town can still be seen in the wealth of its buildings. Tallinn, the capital of Estonia, is named after taani linnus, which means Danish castle. The Castle in question was built by King Waldemar of Denmark in the 13th century. The settlement quickly developed itself into a busy port. In 1248 Tallinn became a member of the Hanseatic League, a chain of European trading cities. 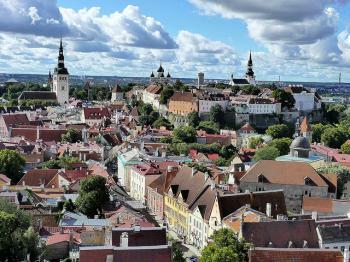 Although I've seen quite a lot of so-called "medieval cities" in Europe, Tallinn came as a surprise. Its whole Old City is without modern buildings or distractions. I had a great time just roaming around without a map, peeking around corners. Highlight - though not medieval, dating from 1900 - for me was the Alexander Nevsky Cathedral. It's a wonderful Russian-Orthodox church that looks like a big birthdaycake. You can see a picture of it on the Estonia country page (click on: Go to Estonia). I visited this WHS in September 2016. I spent 3 days in Tallinn and was able to explore its historic centre quite well. The cruise liner tour groups take over this small city from around 9am till lunchtime and again just after lunchtime till about 16:30. Of the 3 Baltic capitals this seems to be the most negatively effected from the huge cruise liner populations (most probably because of its size) but my early morning and late afternoon strolls helped to enjoy the main sites without the crowds. 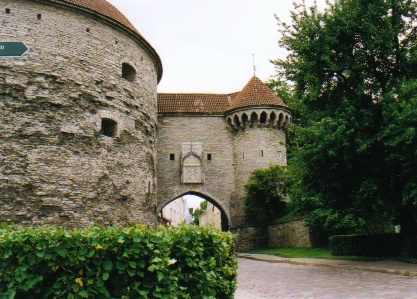 To my surprise, unlike Carcassone in France, nowadays the city walls only encircle a small part of Tallinn. You can actually walk on most stretches of the city walls for a small fee. My favourite was the one with the Kanne Wall Tower as it is believed to be one of the oldest sections of the city wall (16th-17th century). Of the original 3km of city walls with 46 towers, only 1.85km remain with 26 towers. The best places to take in the panoramic views are from the Oleviste Church Tower (picture) or on Toompea Hill from the Patkuli Scenic Viewpoint and the Kohtuotsa Scenic Viewpoint. The best place to take in the architecture and variety of buildings together with the walls is probably Kooli Street. Worthwhile visits (quite hidden) are the Ukrainian Orthodox Church (you have to knock and ask permission to visit) as well as the Old Dominican Monastery and Claustrum (even though 4 euros is a bit too much). I enjoyed exploring literally every street and alley of Old Tallinn and loved stopping for coffee and sweets at Maiasmokk. I was pleasantly surprised to find that the Old Town of Tallinn was not as touristy as I thought it might me. Certainly, around the main town hall square, there were the usual tourist restaurants and buskers (including one man dressed as a knight). But it didn't take much effort to walk away from there and find yourself in streets that were quiet but just as charming. There are some museums to see but I found the thing I enjoyed the most was just walking through the streets and looking at the buildings - there are some really beautiful doors on some of them! There were two things I particularly liked - walking along the old city wall (you get a great view of the city from there) and going just outside the walls on the northeastern border. You can see the fortifications really well (this is where the photo I've attached was taken). Take a beautiful stroll through its medieval streets. Get lost in every corner, walk aimlessly and find beautiful places. Try to avoid the busiest areas, go with your head high and look at all facades to stay totally fascinated. The tramway system in Tallinn is very efficient. It links the bus station, the Baltijaam (railway station), the hotels and the old town. And a 5 day ticket costs only E6! The eating places around the Baltijaam offer good value for money. This was a great place to spend a cold mid-winter weekend. I don’t think I have ever visited an historic centre that is so thoroughly preserved as Tallinn. It seems almost completely devoid of modern buildings and real tourist traps like so many cities of this calibre in Europe are. But Tallinn still had tall buildings and a modern heart, right outside the historic centre, meaning it didn't feel like a museum. We just had great fun wandering around the snowy streets and shuffling into café’s and restaurants to warm up. The view from Toompea castle was very nice, and the Igloo bar that was selling hot chocolate was a lovely reward for the icy climb, they even gave me a discount as it was my birthday. I also enjoyed the interiors of Alexander Nevsky cathedral and the art in St Nicklaus’ church. One quirk that was aimed at visitors, but perhaps I wouldn't describe as a tourist trap is the Olde Hansa restaurant. It serves is a medieval food, but it is exceptionally rigorous using only produce available in Tallinn's medieval heyday, likewise the decoration is very authentic , the whole place is lit entirely by candles, and you will really have to hunt hard to find something that wouldn't have been around in the 15th century. They also have a lovely tavern under the arches of the town hall. I'm not sure if I can say the food was great but it certainly was interesting (they even had Bear steaks on the menu!) and rose above standard tourist fare to give a gentle impression of what life may have been like in the cities past. Tallinn was a great place for a winter weekend, and traipsing through the streets in snow showers was a wonder way to get aquainted with it, though next time I visit I will try and time it so I can hear some performances of the wonderful choral music that Estonia is famous for. We visited Tallinn in May 2008. Beautiful old town, amazingly preserved despite war and the ravages of time. Lots of things to see--the churches, the cobblestone streets, the main plaza, the old pharmacy, not to mention the fortress itself. This was probably one of our favorite stops in Europe. I spent a few days in Tallinn some 8-9 years ago.I loved its old architecture,winding streets,shops,the open air vendors (and their merchandise) on the square (forget its name)and beer.Estonians being in the same ethnic group as us Finns ,swelled my Finno Ugric heart to the bursting point.We both are small nations and have been under many conquerors and now finally our dream of independence has come true. The older part of the city was spared major destruction during WW two, but over 50 years of neglect under Soviet Rule is still evident. Churches become warehouses, museums and dining halls. The three month tourist season provides the major income for residents. There were speciality shops selling woollen products, amber and linens. Under the Soviets about 20 per cent of the population was deported to Siberia including teachers and almost anybody with an education. Estonia is a small country of about 1,500,000 people. 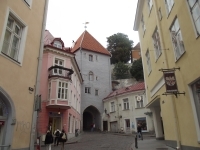 Tallin old town is one of the best kept towns of the similar kind around the Baltic Sea. A visit is highly recommended. If you have more time in Tallin, do try to walk around east of the city centre to see the mix of unrestored houses from Soviet times and all the new houses in very modern style built after the new independence of Estonia. I first visited Tallinn in 1995 and since then I've been here numerous times, not only for leisure but also for business, getting to know loads of nice people over there. 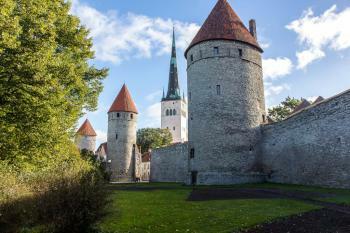 The sheer beauty of the medieval town is really one of the major assets of Estonia and, together with its 'comfortable' price level, spurred tourism from the neighbouring countries Finland and Sweden. Today, Tallinn is the financial engine of the entire country and business is booming. Skyscrapers are rocketing in the modern city centre but the medieval old town is left untouched and is today a great place for a weekend holiday with loads of nice restaurants, pubs, discos, spa's and comfortable hotels. Having seen Tallinn transformed over 10 years from a post-Soviet outpost (though a beautiful one) too a modern city of the European Union is also a witness of a hard-working population who is striving hard to get somewhere. This place is an absolute must and today easy accessible also through a number of low-fare airlines. Go there! Tallinn is a truly exceptional city! I've been fortunate enough to have had the opportunity to visit twice....one as part of a tour through the Baltic Republics of Lithuania, Latvia and Estonia, in 2004...and again a year later as a starting point for a circle tour through to Moscow, St.Petersburg and Helsinki. Equally charming the second time, I did notice however, that Tallinn is becoming quite popular with the tourists. Go soon before everyone else catches on! After spending a day or two enjoying the old town, venture out of the city and head for some of the smaller coastal towns, like Haapsalu,and you'll discover that Estonia has a lot more to offer. While you're there, be sure to try "Vana Tallinn", a unique Estonian liqueur that tastes great in coffee... and will probably have me going back for a third time! Tallinn is one of Europe's best preserved medieval cities, and although the old town is not very big, it does make for a day or two of exploring and strolling its ancient alleys and streets. Being a former Hanseatic city, its architecture closely resembles its counterparts in northern Germany, but with a Baltic and, yes, Russian, flair. The hill with the parliament building and the Alexander Nevsky Cathedral is very nice, and there is a church with a huge belfry (St.Olav's, I believe) that you can climb and that gives you a great view of Tallinn and its port (it was the world's tallest building in the 16th century, I've heard). A very nice destination, but probably not enough for more than a couple of days. It should be combined with Helsinki (very easy), Riga, or maybe St.Petersburg. Tallinn's Old Town (note the capital letters) is a jaw dropping experience. If you leave Estonia without walking around the Old Town for at least an hour or two then you should go home with your head bowed in shame. This is World Heritage in its condensed form. The whole of Old Town can been seen in a few hours (or a few decades depending on your schedule). 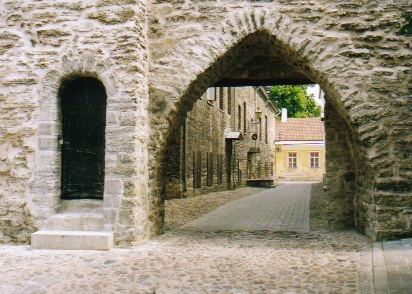 For a focused tour I suggest Pikk tanav (Long street), one of Tallinn's oldest boulevards. Start from the top of Pikk Jalg (Long Leg) in Toompea. Behind you should be the Estonian Parliament building (big and pink) and Nevski Cathedral (big and Russian Orthodox). Head down the Hill to Pikk Jalg Gate. This gate and the wall to your left (know as the Wall of Mistrust) kept the Nobility of the upper town safely separated from the riff-raff downtown. From this gate to the far side of Old Town is less than a kilometer and includes loads of famous buildings as well as enough cafes, restaurants, bars, souvenir shops and museums to satisfy any reasonable cruise ship passenger. I have lived in Tallinn for ten years now, and yet, every time I visit the Old Town I find myself well amazed at its beauty, cultural significance and incredible luck in having survied as wonderfully as it has. Don't miss it! Estonians are our northern neighbours (very good neighbours by the way) and in a way also rivals in healthy competition of two similar countries. Tallinn Old City is better than that of Riga in two points - 1) it is located on limestone cliff - quite impressive; 2) Estonians have been wise enough and spared the Old City from the nightmare of modern arhitecture. They have construction boom nowadays, but - outside Old City. But Riga has some strong points as well. Do I like Old Tallinn? Yes, I like it, almost as at home. Damaged in World War II: Tallin suffered damage during both the Nazi push east in 1941 and the Soviet return west in 43/4. There is some belief that Soviet bombing in 1944 was directed at civilians opposed to Soviet return. "The worst damage to the town was in the air raid of 1944. St Nicholas' church and the quarters surrounding it were destroyed, a total of 11% of the historical centre"
Mummies: St Nicholas' Church - The side chapel used to hold the mummy of Duke Eugène de Croÿ, the commander of the Russian army at Battle of Narva (1700).